The Kruckeberg Botanic Garden was founded in 1958 when Dr. Art Kruckeberg and his wife Mareen moved to a 4-acre farmhouse in Shoreline. Over the ensuing decades they created the Garden, growing nearly every plant from seed or cutting. Art and Mareen took an informal, naturalistic approach to design, combining Northwest native plants with unusual and rarely cultivated species collected from the West coast and around the world. The result is a unique Puget Sound woodland garden. 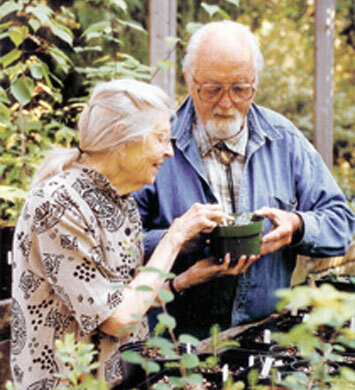 Dr. Arthur R. Kruckeberg, was a professor of Botany at the University of Washington and his wife Mareen S. Kruckeberg, was a self-taught botanist who founded the onsite MsK Nursery. 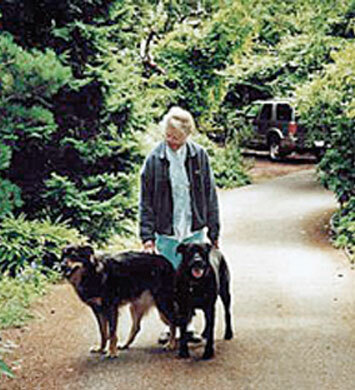 Both Art and Mareen Kruckeberg were active with local horticultural societies and helped form several that are still active today, such as the Washington Native Plant Society, the Hardy Fern Foundation, the Northwest Chapter of the North American Rock Garden Society and the Northwest Horticultural Society. They collaborated on the creation of Gardening with Native Plants of the Pacific Northwest, a classic gardening guide, named one of the top 50 gardening books of all time by the American Horticultural Society. The legacy of these two horticultural icons, like the roots of a tree, spread powerfully into the soil and psyche of the Pacific Northwest. The botanical richness of their Garden is a living expression of their generous and abundantly creative lives. Arthur was born March 21, 1920, the first day of spring, in Los Angeles. His grandfather and father owned and operated Kruckeberg Press, a printing business that specialized in horticultural matters. In 1941 Arthur graduated Phi Beta Kappa from Occidental College with a B.A. in biology, then went on to graduate school at Stanford. He was married in 1942 to Lyle Elayne Moore, with whom he had three children. His academic career was interrupted by WW II: from 1942-46 he served as an officer in naval intelligence. After training in the Japanese language, he served in the Pacific Fleet, interrogating prisoners during the Philippines campaign and serving as interpreter in Japan and the Marianas Islands after hostilities had ended. Art returned to graduate studies in 1946, this time at the University of California, Berkeley, with its strong botany program. By 1950 he had earned a Ph.D. in botany. That same year Dr. Kruckeberg began a long and distinguished career on the faculty of the University of Washington, where his major interests were in regional floras and vegetation on unusual substrates. In 1952, Arthur’s wife, Lyle, passed unexpectedly. He retired from the UW in 1989 as Professor Emeritus of Botany. 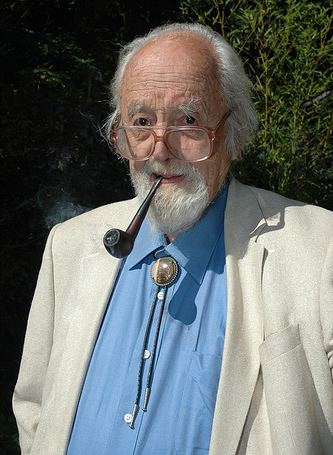 He has accomplished much professionally, including publishing six books: Gardening with Native Plants of the Pacific Northwest (1982); California Serpentines: Flora, Vegetation, Geology, Soils, and Management Problems (1984); The Natural History of Puget Sound Country (1991); Geology and Plant Life: The Effects of Landforms and Rock Types on Plants (2002); Best Wildflower Hikes (2004); and Introduction to California Soils and Plants: Serpentine, Vernal Pools, and Other Geobotanical Wonders (2006). He is a co-founder of the Washington Native Plant Society. Dr. Kruckeberg passed away on May 25th, 2016 at the age of 96. Mareen was born January 10, 1925, near Harrisburg, Pennsylvania. She moved to Washington State as a child. Separated from her birth family at age five, she was adopted at age eight and grew up in West Seattle. An early interest in plants arose during trips with her mother and aunt to such places as Mt. Rainier and Olympic Hot Springs, and that interest was cultivated by the attention of park rangers to a bright and inquisitive youngster. After finishing high school in 1942, Mareen worked for the U.S. Army in Alaska for five years, at the University of Alaska. Mareen entered the University of Washington in 1951. Her initial interest was in trees, which necessitated prerequisite studies in basic botany. Art knew Mareen as a student, and she distinguished herself academically on a summer field trip he led in 1952. Art and Mareen were married in 1953, a year after he was left a widower and father following the untimely death of his first wife. The new responsibility of raising three young children made it impossible for Mareen to continue at the University, but her interest in botany and horticulture continued to grow. Mareen passed away on January 1, 2003 at the age of 78. The Kruckeberg family grew to six in 1957 with the birth of Mareen’s first child, and soon they were looking for more living and gardening space than was afforded by their Capitol Hill home. Mareen discovered property for sale in Richmond Beach, about two miles uphill from Puget Sound. In love with the potential of the property for a garden, legend has it that she agreed to buy without even looking at the house itself. Mareen and Art’s new purchase was about one acre in area, with a two-story house and a separate two-car garage. The house had been built in about 1904 as a farmhouse, then remodeled in 1938. The first settlers had arrived in Richmond Beach only about 70 years before, and in the late 1950s the property on 15th Avenue NW was still more rural than suburban, with much nearby pasture land and even a log cabin to the east. Old, late-successional Douglas fir dominated much of the landscape. It was a place where Art and Mareen could realize a shared, passionate ambition to create a garden in which the native landscape would be preserved, but complemented with rare and unusual woody and herbaceous plants from other lands. Mareen’s father, Grandpa Schultz, soon purchased the property that bordered Art and Mareen’s acre to the east. That land, mostly lower lying, had been a strawberry field, and it wasn’t long before it became pasture for the children’s horses. In 1963 a fifth child joined the Kruckeberg family. In the 1960s the original farmhouse was remodeled again, and Grandpa Schultz converted the garage into a cozy cottage for his wife and himself. Mareen’s interest in plants led to construction of her first greenhouse, completed in 1970. By then she was known in horticultural circles as an expert in growing and caring for plants, both native and exotic. When Mareen realized that the occasional sale of plants to friends and neighbors was “extra-legal,” MsK Rare Plant Nursery was born and certified with a business license for which she paid the grand sum of $1.00. A second greenhouse was added in January 1976, and the Nursery continued to grow and thrive. Meanwhile, both Art and Mareen had been busy introducing a wide variety of trees, shrubs and herbs to the property, including the lower pasture after the family interest in horses subsided. They brought some plants with them in 1958, including a four-foot giant sequoia tree. Generally, though, growth of the garden depended less on collecting than on cuttings and seed from their own established plants and seed from various botanic gardens and seed exchanges. The resulting landscape is a mix of native species with choice specimens from other lands, mostly China and Japan. The fruit of the Kruckebergs’ labor is a park-like botanic garden that, almost 50 years later, has gained regional significance. In 1998, friends and neighbors formed the Kruckeberg Botanic Garden Foundation (KBGF), a nonprofit organization dedicated to preserving the Garden and providing assistance with maintenance and events. On October 14, 2003, Art Kruckeberg signed a Grant Deed of Conservation Easement that protects the property in perpetuity from development. The citizens of Shoreline approved a Parks, Open Space and Trails bond in 2006, which enabled the City of Shoreline to purchase the Garden from Art Kruckeberg in January 2008. The KBGF and the City have formed a partnership charging the Foundation with running the Garden and the on-site MsK Nursery.